Two Nigerian startups, CredPal and Growsel, and one Kenyan startup, Mookh Africa came out victorious at the Visa Everywhere Initiative, which came to a close in Johannesburg, South Africa. The three startups came out on top of nine other contestants who took part in the initiative. All FinTech startups, the Visa Everywhere Initiative put out a challenge for them to deliver solutions based around three real-life business challenges. And they delivered. CredPal won this part of the challenge, receiving a price money of $25,000. The startup creates a solution that allows businesses and individuals get to pay for purchases in installments. It does this by providing users with an instant access to credit at the point of checkout, and serves both online and offline merchants. The winner of the aspect was Growsel. They have a solution which does well to connect under-financed smallholder farmers with investors via mobile phone-based Peer-to-Peer (P2P) lending and marketplace sales. They also give these farmers access to the best agricultural practices. They were also awarded $25,000 for coming top in this category. Kenyan startup, Mookh Africa, who also won the overall prize for its idea, won this category. 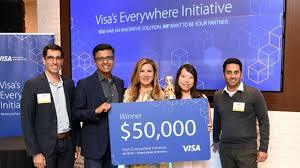 Hence, they went home with $50,000 with an opportunity to work with Visa to develop the concept further. Other Nigerian startups at the sub-Saharan edition of Visa Everywhere Initiative includes Voguepay and Loystars. The initiative encourages startups to solve challenges that are likely to face the commerce industry in the future. Funding Visa, Visa Everywhere initiative. permalink.